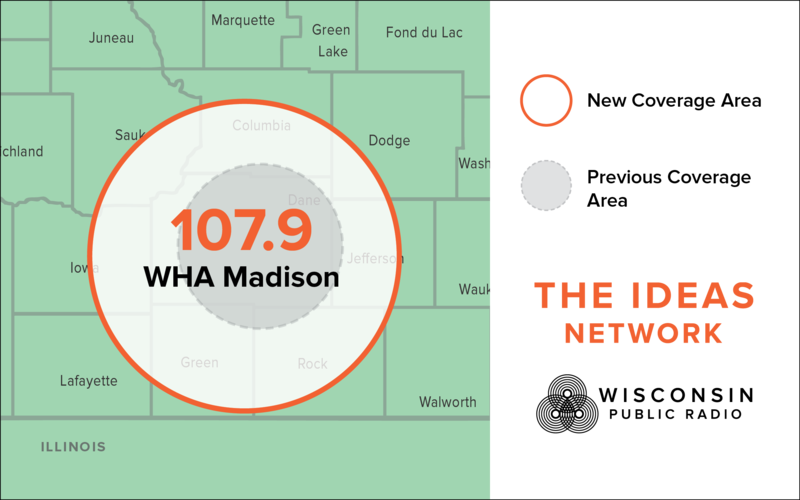 We are excited to announce WPR has strengthened The Ideas Network signal at 107.9 FM. The best part is you can now tune your radio to 107.9 and leave it. "This investment in an improved, stronger broadcast provides continuity for our listeners. They can stay tuned into 107.9, instead of moving between the 90.7, 107.9, and 90.9 signals, or listening to AM 970. It’s a great convenience," said Mike Arnold, WPR chief operating officer. The expanded signal covers all of Madison and outlying areas including Sun Prairie, Mazomanie and Sauk City. A further ring of good reception reaches towns about an hour’s drive from Madison, such as Baraboo, Portage, Fort Atkinson and Monroe, though actual reception in the outer ring may vary depending on what kind of antenna listeners use. Let us know where you are picking up the signal, maybe even send a photo of your radio tuned to 107.9. Email listener@wpr.org.